Susan Hammer (Riverview Realty Partners) and Joell Molk (Golub Realty Services) awarding me the Full Designation Scholarship at the 2013-14 TOBY/Gold Circle Awards Gala. 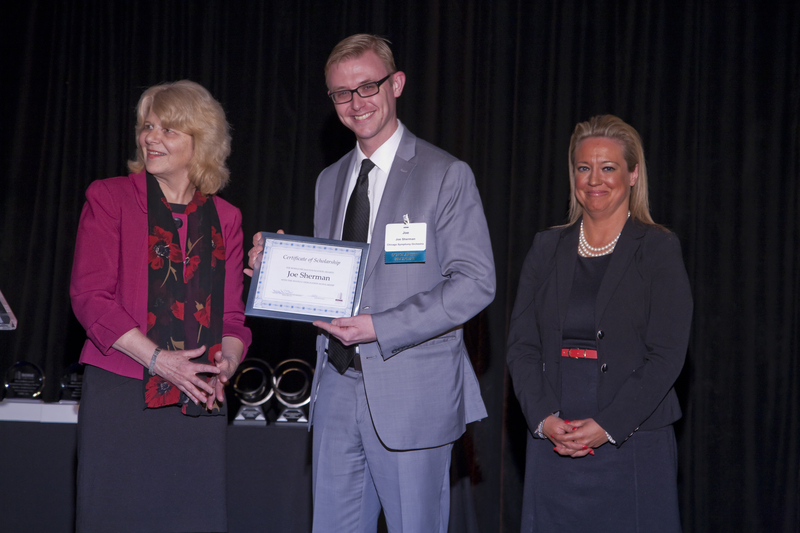 Earlier this year, I was incredibly fortunate to receive the 2014 BOMA/ Chicago Foundation Full Designation Scholarship. The entire commercial real estate community has been very welcoming and I’ve met a lot of interesting people with all sorts of experiences, personally and professionally. A common experience I’m finding the more that I meet people in CRE is that many of us landed in this field and in our careers indirectly, and sometimes even unexpectedly. Frankly, this came as a relief to me – I had gone to college for theatre, after all! After earning my undergraduate degree, I spent five years overseeing the facility and operations of Botanicals, an event design firm that was located in a warehouse space at 2214 N. Elston. After years of executing special events of all sizes in countless buildings and venues throughout Chicago and the surrounding suburbs, I found myself eager to be a part of an operations team in a larger facility. My rich and varied professional experience, combined with a background in Chicago theatre, led me to shoot for a job specifically at a venue. Working at a downtown venue felt like it would be a great fit because it would combine my experience producing events and my undergrad studies in theatre. During my tenure at Botanicals, I had overseen the installation of several events at Symphony Center. I always made a mental note of how Symphony Center was an expertly run venue with an efficient and impeccably professional environment – not to mention a product that has always performed at the highest level. So, when the Operations Coordinator position opened up in the summer of 2007, I jumped at the opportunity and was lucky enough to be chosen for the position. Last month, my BOMA/Chicago classmate, Kristine Sorenson, posted a blog on the Elevator Speech that touched upon the importance of having a support system and the value of your peers and supervisors’ expertise. I couldn’t agree more. I was fortunate enough to have that immediately in John Maas, RPA/FMA, the Director of Facilities at Symphony Center. From my first day on the job, he was very upfront with me – if helping run a facility was something I enjoyed, I should really consider pursuing an education through designation courses offered at BOMA/Chicago. His mentoring has been essential to my success at the CSO, my experience working toward obtaining my RPA/FMA designations and my pursuit of the Full Designation Scholarship. I’m finding that one of the main differences between the daily tasks of my peers in the designation program and my own is this: working on tenant’s needs is actually a pretty small part of our job on the Facilities team at Symphony Center. In fact, we only have one tenant, Tesori, a restaurant located inside Symphony Center at 65 E. Adams St. offering Italian-inspired cuisine. Tesori is operated by Blue Plate Catering/Applause Food Services. Blue Plate/Applause is also the exclusive caterer to Symphony Center. The Symphony Center staff works very closely with Blue Plate/Applause, as they provide all food and beverage for rental events, in-house meetings, events and the concessions for all our concert programming and third party concerts. It’s really more of a longstanding partnership than an owner-tenant relationship. While we only have one tenant, we do have hundreds of rental clients. As a non-profit organization, the CSO is always looking for opportunities to support the bottom line. One way of doing that is from renting out Orchestra Hall and the various event spaces at Symphony Center. Renting event space comprises at least half of my daily work: from marketing the space, to contracting and invoicing rental clients as well as producing the concert or event. The relationship with our patrons is a tremendously rewarding one as well. As the CSO has been a pillar of Chicago since 1891, our concertgoers take genuine pride in the orchestra and its historical building. We get to preserve that history for generations to come and help the organization thrive. Everything we do is for the support and advancement of our single biggest asset: the Orchestra. As an arts organization, the CSO is lucky to own its own facility. In the Operations & Facilities departments, I have the privilege of helping make that facility run at the very highest level. And my RPA/FMA education through BOMA/Chicago is proving invaluable to that experience every day. This entry was posted in Uncategorized and tagged 2214 N. Elston, 65 E. Adams St., Blue Plate Catering/Applause Food Services, Botanicals, Chicago Symphony Orchestra, full designation scholarship, Joe Sherman, John Maas, Kristine Sorenson, Real Property Administrator, RPA/FMA, Symphony Center, Tesori. Bookmark the permalink.